Re: WWI - Gallipoli V17 (p9) - Land Starting Positions? I would anticipate that you may get the general comment that the starting positions need to be relatively fair for different numbers of players. You have battleships, landing craft and land starts for 8 players. With a different number of players - wouldn't the unused starts be shared-out amongst the players? It would be great if the xml enabled different starts to be coded for different numbers of players. Its a change I would like to see + and would help many potential maps. Yes these starts are shared out amongst the players in any game, there are 40 starting terts - 24 sea (includes 8 battleships) and 16 land. IN the xml , one has to specify what terts are starters. the xml idea would be good, perhaps suggest it. The battleships idea is totally innovative. I'm guessing they cant attack, only bombard. Brilliant. 3 of the landing craft have nightmare scenarios - attack mines and subject to bombardment from the forts. yes i relaise that, but that is in line with the real battle. I can't really fit 8 in there, it would be too crowded. Similarly, some of the land starts can be bombarded whilst others are safe - I'd suggest all land starts start safe and have an adjacent 'safe' territory to give players an early-game option to start building? Similarly, in the south of the map, the starts nearest crossing points are more advantageous. There look to be 13 - I'd suggest having 2 or 3 in the southern area - preferably 2 close to the landing points - those on the mainland I would suggest they are spaced apart from each other as much as possible and are relatively similar (i,e. not bombardable and away from the forts). Well the whole idea of using the battleships is to have some occupied terts and some un-occupied terts begin bombarded. This gives one an opportunity to whittle down you enemy a bit, as well as destroy some neutrals on terts that are strategic points for landing. I'll ensure that i do something to make everything as even as possible. In general, as well as the battleships gameplay - I like the landing craft idea which is balanced by the land starts being away from the beaches. I think the first thing to think about would be the landing craft in the straight. ONce again, reality with what happened. - the beach territories, rather than having a smidgen of sand, should be completely white i think, that would make it really obvious and clear. otherwise, it looks great. good work on another solid map mate. left side being dim is representative of the attack at down. I will try ot make the tert names as clear as possible. i'd prefer to keep the small areas of beach as are, i think the map would be overpowered if one were to make those beach terts white or snady coloured, and it is mentioned well in the legend. dolomite13 wrote: What does L9 connect to? ... the line hits the border between B and C.
C beach, i'll fix that. I've been thinking about that and it will be in the legend that only the terts in front or in close proximity with be bombardable from forts each side of the sea. Can forts bombard all sea territs in both dardanels and narrows? or do some forts bombard one and some bombard the other? how is this defined? on the map? OK, it occured to me that the forts in front of the mine positions became redundant because the sea mines reverting to neutral each round. So I have moved the sea mines out of the sight of forts and created three more Mine Sweeper "safe" type places where the mine sweepers can be bombarded from the forts. With this there is good element of "running the gauntlet" in there. 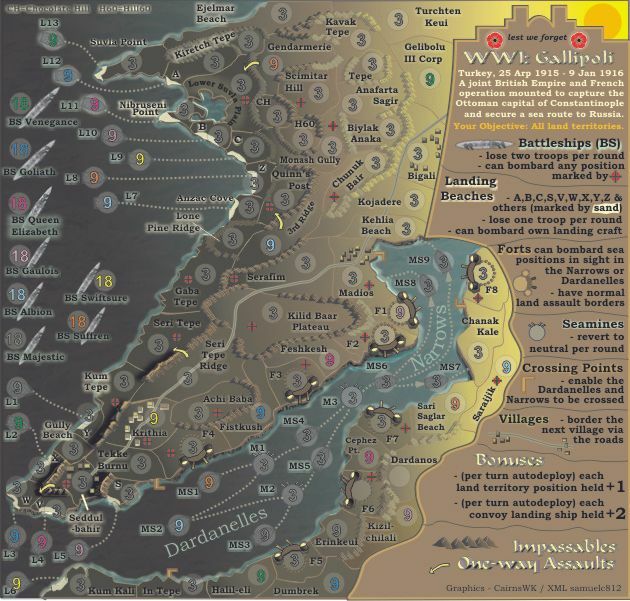 Version 18 has those new terts on the Dardanelles and the legend adjustment for the Forts. The imige doesn't show up for some reason. This happened with the last version too, but it didn't seem to happen for anyone else. captainwalrus wrote: The imige doesn't show up for some reason. This happened with the last version too, but it didn't seem to happen for anyone else. Did you try to f5? Mmm…cairns it looks like with the battleships we'll be headed down the Das Schloß route, seeing how the battleships cannot be attacked and only bombard. Thus, the only way to win is by the (very hard) objective — even harder in an assassin game. So perhaps if there would be a way to have some coastline territories bombard the battleships? the.killing.44 wrote: Mmm…cairns it looks like with the battleships we'll be headed down the Das Schloß route, seeing how the battleships cannot be attacked and only bombard. Thus, the only way to win is by the (very hard) objective — even harder in an assassin game. So perhaps if there would be a way to have some coastline territories bombard the battleships? Yes i'm looking into that to see if there were any turksih defences that had that capability. In May the British naval artillery advantage was diminished following the torpedoing of the battleship HMS Goliath on 13 May by Turkish torpedo boat Muavenet-i Milliye. Shortly after German submarine SM U-21 sank HMS Triumph on 25 May and HMS Majestic on 27 May. Following these losses much of the battleship support was withdrawn and those remaining would fire while under way, reducing their accuracy and effectiveness. Yes, that is so. but this map is not set in May. It's set in April that's why there is a landing at Anzac Cove 25th April on the map. And that withdrawl of battleship capacity was what i was hoping to achieve with the per turn reduction in numbers on the battleship if players didn't use them. I will still follow up and do some more research to see if the Turkish had capacity to reach the battleship way out to see. Cairns, I have to say that this is my favourite of your maps currently in development. The key concern that I anticipate, will be the unattackability of the battleships (which I'd prefer to see relabelled as HMS Whatever as opposed to BS Whatever) in conjunction with an incredibly difficult objective. sorry for popping in so late. The looks of the map is beautiful and I like the mechanism of auto losing troops on the ships (here it makes sense ). There are landing beaches a,b,c etc. that auto lose -1 .
fine. I don't foresee if this could lead to "unfair" entrapment for players that have/had a bombardment ship, doing a landing , getting ripped of all other terr. on land in the mean time and then see their numbers dwindling by opponent attacks AND these two auto reduction kills. A few rounds of playing is needed. The X and V and S are not clear enough visible on the map. I was looking for D and E after B..but then I see Z ? And below i see s,v,w, and then x, y, ...(far away).. z ? But why is Suvia Point not being auto -1 reduced ? and nibruseni point ? and Anzac point ? and Chanak Kale (in face of guns at F7) ? If there is no particular reason why the mentioned landing points are safer than the a,b,c, etc landing points, then why not REMOVE all the A,B,C ,X,Z markers and simply state in the legend that ALL landing points (recognizable by the dotted sea connection) suffer -1 attrition per turn. the YELLOW player has no 9 starting field on the right coast. (Erinkeui looks like the place for it..oh no that is grey!). 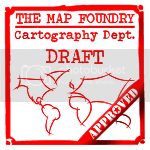 MrBenn wrote: Cairns, I have to say that this is my favourite of your maps currently in development. Phew, that's nice, at least i can do something that has appeal your you guys LOL. Yes, i agree, we don't want another Das Schloß on our hands, so i am working on those aspects. lt_oddball wrote: sorry for popping in so late. Goodness, lt...you're not late, this isn't in Final forge yet. Yes maybe some adjustment would be diesireble during testing there. There isn't any D, E, etc after B, that's the name of the exact beaches, and i wouldn't change that for historical accuracy. I initially had the beaches listed from the top of the map down. until someone suggested they go in the legend as they are now, so let's see if there is any other objections about this. Suvla Point etc, ader marked as being with sand in the legend and represented as "others". Chanak Kali, Kehlia Beach and Madios are not part of the "makred" initlal landing beaches, they have to run the gaunlet of the sea mines, and i think it would be unreasonable to giove them -1 per round lose after traversing the sea mines and the fort guns. Yellow, i missed him, will fix. He'll take over one of those grey neutrals. My only concern is about the actual gameplay that makes impossible win an assassin game killing your target...this map is only an objective one. Can't wait for this map. Whats the projection at this point? istanbul39 wrote: Can't wait for this map. Whats the projection at this point? Oooh... long way to go istanbul39, thanks for dropping in for comment though. I have to find out if there were any large guns on the peninsula that could have taken out the battleships, as a way of "destroying the enemy" so that this game doesn't remain an unachaiveable objective game. thenobodies80 wrote: Good Idea, good map. It's not showing up again. captainwalrus wrote: It's not showing up again. What's not showing up again, captain? for the past two versions, the map isn't showing up at all. The most fantastic museum I have ever been to is the war Museum and Anitkabir in Ankara. In one section, you walk through a simulated Geibolu. Absolutely amazing! The sound system gives you the sense that bullets are whizzing past your head and the mortar exploding at your feet. You can walk through the medic tents as the Red Crescent attend to the wounded. Make your way to the attack hills and hear the "Mehmets" chanting "Allah, Allah, Allah..." as they go find their bullet. Can not visit there enough. I'm sure nothing you have not seen already but this is an interesting web site.